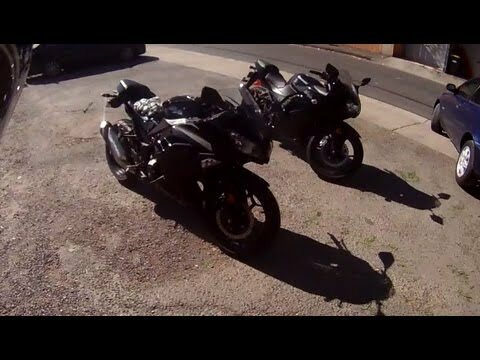 My old Ninja 250 vs a new Ninja 300! 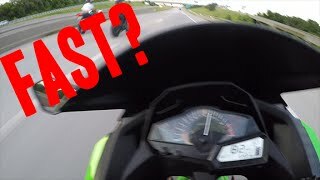 He says going the same speed he was on the 300.
which exhaust it is for that green ninja? Ok so I need some opinions. 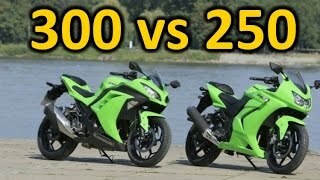 I have an option of buying a ninja 300 2016 with 2200km's for 3300euros, while I can buy Ninja 250 2011 with 20.000km and sport exhaust for 1700euros. Which one should i go for ? As you will probably sell a 250/300 to buy something bigger after a small amount of time, always go with the cheaper option! Unless the cheaper option is a piece of crap. 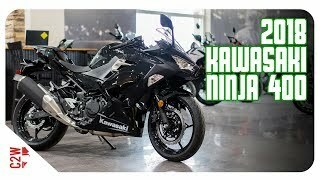 +KnivesNGunsBoy Yea I mean I know it's better idea, but I can get ninja 250 almost for the half the price... I am so not sure. I mean if I do go for a 300 I won't have any extra money to upgrade anything + to buy gear for myself. (I have cheap gear currently as I was riding a 125cc motorcycle). 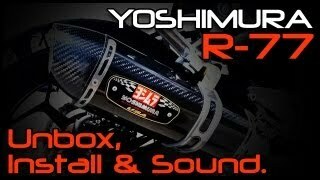 why do these bikes sound inline but if I look up the sound of a 250 or 300 of the same year it's rumbly like a vtwin or cross plane? Awesome video dude. You just sold it to me. I'm going to dealership tomorrow! Thanks for helping me chose. I saw a dude almost get killed on a motorcycle today. it was scary. Some lady darted out in front of him on an intersection and almost killed him. 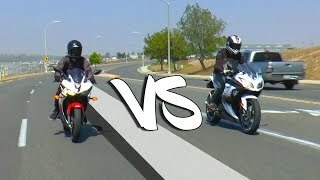 You guys should be ware that cars kill you on a bike cause they can't see you and you are going fast so it makes you harder to see. So cars pull out in front of you like that and can kill you. 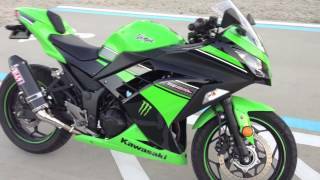 fun video to watch.. yeah haha.. ninja twin cylinder power.. wohoo..
Haha every commentator should be British. I love the Top Gear commentating style. You just got yourself a new subscriber. I usually don't watch these type of videos but you are pretty entertaining. For anyone watching this recently and looking between a 250 or 300 ninja. 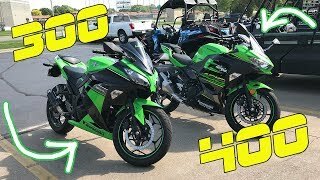 Just go with the Ninja 300. It's such a better bike. Better fuel injection, clutch is great. Get the abs and it's great as well. The bike inspires a lot of confidence. I have had no riding experience jumped on the bike for about 5-10 mins up the road then proceeded to ride with the old man for about 3-4 hours in traffic with no issues. 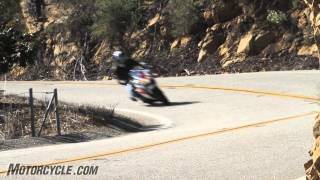 Just take your corners a bit slower until you're more comfortable with the bike. 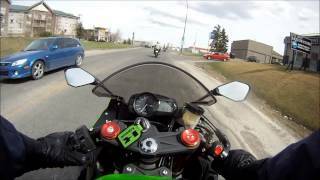 The best part about the ninja 300 is there is so much aftermarket options it's silly. you can replace the entire fairings on the bike for about $300-600 AUD. Just nonsensical. Looking at getting a 300 as my first bike, any advice on how much it costs in the long run for servicing etc? I'm looking to buy used since I'd rather not worry as much about dropping it etc. I am 5ft 4ins and I own one. Find a dealer and sit on one. 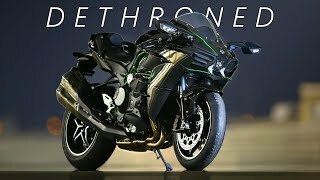 Keep in mind that aftermarket "lowering links" are available to bring the bike down some and there might be some seat modifications to also help. i was nervous at first but it got comfortable after a few laps up and down the street and shifting into first and second. i dropped it in the first 15 minutes of riding i was riding at 10kms when i let go of the throttle abit the bike jerked forward as the engined braked and i panicked and the bike just fell. nothing was damaged only a small scratch on the side. the indicators were fine as they are integrated into the fairings so they couldnt be snapped off like other bikes if they were dropped. i got back on and started riding. my biggest mistake was not trusting the bike and i panicked. constant gear changing aswell as you instantly need to go from 1st into 2nd. the clutch is probably the most forgiving. ive made so many embarrassing gear changes its a joke but if it wasnt for how fogiving this bike is i would have been dead. 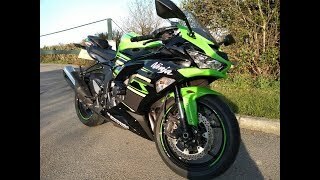 i now know how to shift properly and smoothly and my knowledge is increasing the more i ride this bike. i am 120 kilos and this bike carries me around comfortably at 130kms on the ringroad everyday with a little more room to go faster. the bike encourages confidence in leaning in the corners. i have 140 back tyre diablo rosso 2 tyres i havent had any others so i dont know any better as i got nothing to compare too. 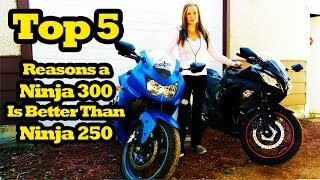 just a lil info on my riding experience on the ninja 300 i ride every day rain hail or shine. 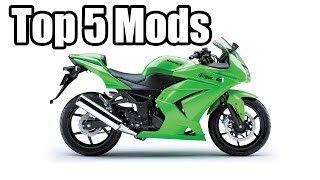 its a great bike to learn how to ride but im warning you that too many safety features as abs and slipper clutch light weight handleing plus more upright position could hinder you when going to a more powerful bike with a much more agressive riding position. 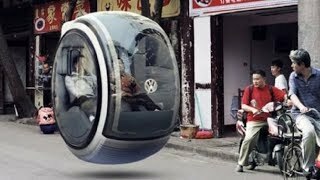 as you would depend on those safty features instead of learning proper technique in braking and what not. 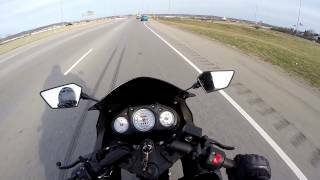 250: Drop a gear and.. uh. wait for it. he's uh, hes almost gone. 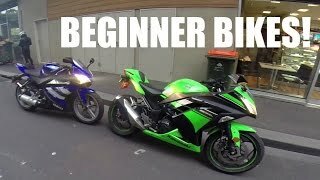 What Makes A Good Beginner Bike! 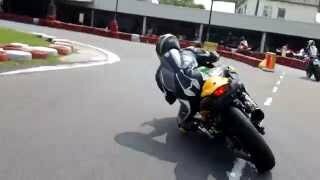 Ninja 250 Rocking a GO-KART TRACK!